Provia 100F is alternately accused of having a very blue cast, or a very orange cast. I think I’ve managed to show both of those in this single photo. These bright yellow tulips were in full bloom when I happened by, and while tulips do have blueish-green stalks and blades, but not as blue as the film represents. Along with that, the tulips I saw were very (and I mean VERY) yellow with tiny orange/red highlights. 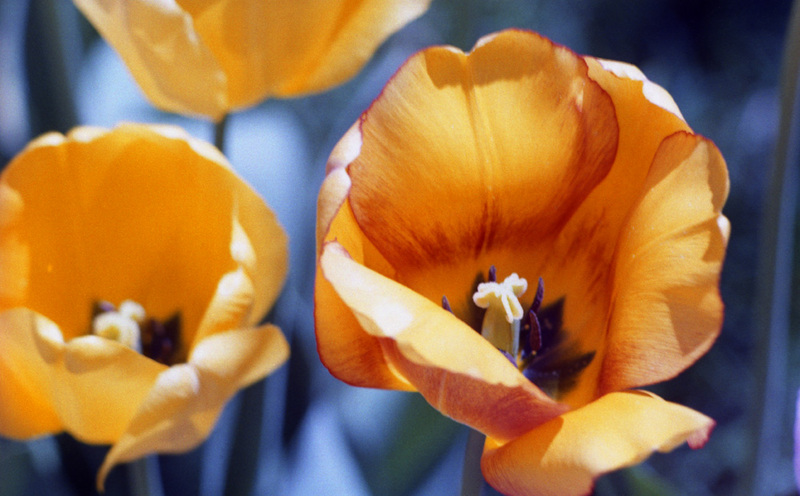 The film results show a more orange-colored yellow, and much darked, more-reddish, accents on the petals. The almost white of the pistil and the extreme purple of the stamen are represented as I remember them. The homeowner was working on her yard when I walked past and I photographed several of her gorgeously-cultivated flowers with her permission. Shot with my Minolta XE-7 and MC Rokkor-PF 58mm f/1.4 lens at 1.4 and 1/1000 sec. using Fujichrome Provia 100F color reversal film. Scanned with my Epson Perfection V600; some scanner dust removed with Photoshop.